If you love design, decor, and creating cohesive color schemes, interior design could be an excellent career choice for you. A designer is hired by individuals, companies, and real estate agents to decorate spaces, such as offices, living rooms, or bedrooms. They take into account a client's taste, budget, and the space to come up with a look that matches the customer's needs. Interior designers typically handle cosmetic changes that may or may not be part of a more extensive renovation. For instance, rather than installing new granite countertops or knocking down walls, an interior designer chooses paint colors for the walls, selects the styles of furniture, and coordinates the colors for drapes, curtains, and accent pieces. If more construction work or other extensive renovations are part of the project, the designer also may coordinate with the contractor. Communication: As a designer, you will meet with clients to discuss their ideas, so it's essential that you communicate effectively and listen attentively. In addition to working well with clients, you need to be able to communicate with contractors who might be overseeing the broader project and with vendors who might be supplying artwork, furniture, and more. Vision: Part of being successful as an interior designer is being able to see what space can be. This can be looking at an empty room or office and envisioning what can work in that space, or it might be looking at a decorated space and imagining something significantly different. Unlike looking at a blank canvas, this requires the ability to see potential in natural lighting, the angles of walls and ceilings, and more. Creativity: Keeping up to date on current styles and trends is an important part of the job, as is a knowledge of complementary colors. It's also necessary to be able to translate your artistic eye to a sketch that conveys ideas to clients. A design degree or other certification is helpful, but equivalent experience can be gained through internships or apprenticeships with other designers. Flexibility: Interior design is not always a 9-to-5 job. While it can be if most of your clients are businesses, you'll likely have to meet with residential clients in the evening or on weekends on occasion. If working with both business and residential clients, it's obviously necessary that you have enough flexibility to meet at any time. Problem-solving: Projects rarely go as smoothly as planned. Unexpected delays can lead to unexpected expenses. Artwork, furniture, or another item a client wants might suddenly become unavailable, or renovation plans might change for a variety of reasons, leading to necessary changes in the interior design. On top of all of that, clients might prove to be fickle, changing their minds and requiring you to adapt on the fly. Budgeting: Strong budgeting skills are necessary, especially since many clients will be looking to do as much as possible for as little money as possible. Succeeding in this regard sometimes requires financial creativity as much as it requires design expertise. In addition to being good with numbers, this also is a matter of being good with vendors. For example, if a particular fabric or color is popular at a given time, you likely can buy a higher volume at a lower rate with confidence that you'll be able to use it all. Computer-aided design (CAD): Technology is a bigger part of interior design than it's ever been in the past. Software programs allow designers to show clients what spaces will look like by creating them digitally. It's important to gain experience with such software to be successful in the field. As of 2017, interior designers earned a median salary of about $51,500 per year, according to the U.S. Bureau of Labor Statistics (BLS). Job growth for the decade ending in 2026 is projected at 4 percent, which is less than the 7 percent growth projected for all occupations as a whole. 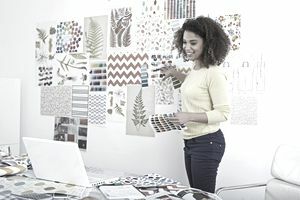 According to BLS, about 19 percent of interior designers are self-employed, and more than half worked for specialized design firms or for architectural or engineering firms.